Diver Systems. there was a better way that operators could operate offshore, (With our platform) an operator can buy a sensor from and operators could be using technology. We sketched out a a manufacturer and plug it into his Greensea system. That roadmap, and it was through integration and it was through is a huge concept in our industry, to provide a core system autonomy; using autonomy as a tool for the operators, not to architecture that allows an operator to integrate any sensor, replace the operators but to elevate the operators. any device, to integrate new technologies, to integrate inertial navigation and positioning and autonomy. From your perspective, put on a curve acceptance of the Our company today is much different than our company attitudes that you’re talking about. Where are we today? was 10 years ago in the sense that we are now really focused on commercial growth. And we are focused on integrating our The doors have ? ung open and the clouds have parted, products into the marine industry, whereas 10 years ago we because the operators are asking for it. were focused on technology development. How are we most the same? We are the same in the sense that Why are the operators asking for it? 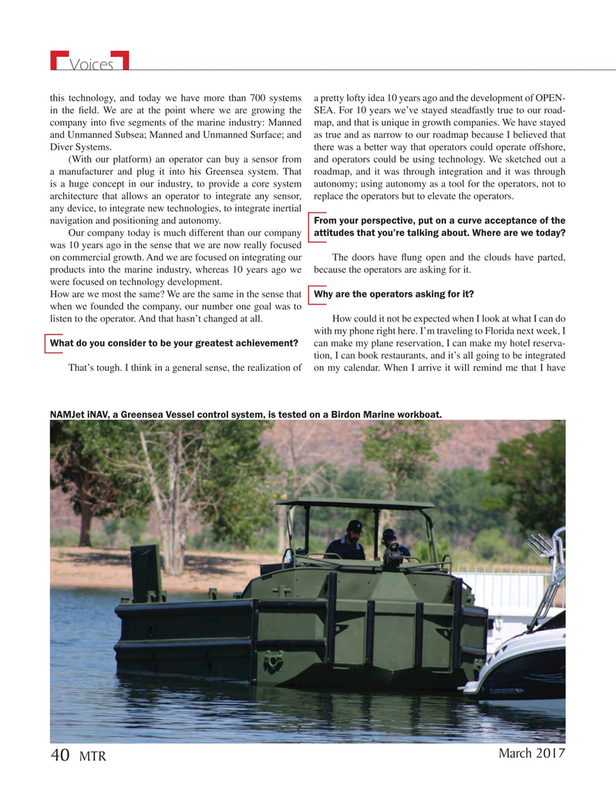 NAMJet iNAV, a Greensea Vessel control system, is tested on a Birdon Marine workboat.